The Mayflower was originally bound for the Colony of Virginia, financed by the Company of Merchant Adventurers of London. Storms forced them to anchor at the hook of Cape Cod in Massachusetts, however, as it was unwise to continue with provisions running short. This inspired some of the non-Puritan passengers (whom the Puritans referred to as "Strangers") to proclaim that they "would use their own liberty; for none had power to command them" since they would not be settling in the agreed-upon Virginia territory. To prevent this, the Pilgrims determined to establish their own government, while still affirming their allegiance to the Crown of England. Thus, the Mayflower Compact was based simultaneously upon a majoritarian model and the settlers' allegiance to the king. It was in essence a social contract in which the settlers consented to follow the community's rules and regulations for the sake of order and survival. The Pilgrims had lived for some years in Leiden, a city in the Dutch Republic. Historian Nathaniel Philbrick states, "Just as a spiritual covenant had marked the beginning of their congregation in Leiden, a civil covenant would provide the basis for a secular government in America." 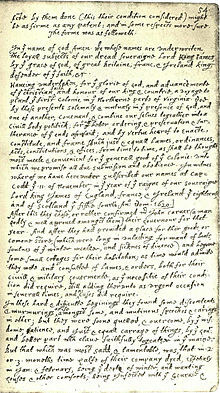 The original document has been lost, but three versions exist from the 17th century: printed in Mourt's Relation (1622), which was reprinted in Purchas his Pilgrimes (1625); hand-written by William Bradford in his journal Of Plimoth Plantation (1646); and printed by Bradford's nephew Nathaniel Morton in New-Englands Memorial (1669). The three versions differ slightly in wording and significantly in spelling, capitalization, and punctuation. William Bradford wrote the first part of Mourt's Relation, including its version of the compact, so he wrote two of the three versions. The wording of those two versions is quite similar, unlike that of Morton. Bradford's handwritten manuscript is kept in a vault at the State Library of Massachusetts. The document was signed under the Old Style Julian calendar, since England did not adopt the Gregorian calendar until 1752. The Gregorian date would be November 21. A list of 41 male passengers who signed the document was supplied by Bradford's nephew Nathaniel Morton in his 1669 New England's Memorial. Thomas Prince first numbered the names in his 1736 A Chronological History of New-England in the form of Annals. The original document has been lost, so Morton is the sole source for the signers. He probably had access to the original document, but he could not have known the actual order in which it was signed simply by inspecting it. Morton's arrangement of names might not have been the arrangement on the original document, and the names on the original may not have been arranged in any orderly fashion. Prince's numbers are based solely on Morton, as he himself stated. Morton's list of names was unnumbered and untitled in all six editions (1669–1855), although their order changed with successive editions. In his original 1669 edition, the names were placed on two successive pages forming six short columns, three per page. In subsequent editions, these six short columns were combined into three long columns on a single page in two different ways, producing two different orders in unnumbered lists of signers. The second (1721) and third (1772) editions changed the order of the first edition by combining the first and fourth columns into the first long column, and similarly for the other columns. The fifth (1826) and sixth (1855) editions returned the names to their original first edition order by combining the first and second short columns into the first long column, and similarly for the other columns. Prince numbered the names in their original 1669 Morton order. He added titles (Mr. or Capt.) to 11 names that were given those titles by William Bradford in the list of passengers at the end of his manuscript. The following list of signers is organized into the six short columns of Morton (1669) with the numbers and titles of Prince. The names are given their modern spelling according to Morison. Use the numbers for the order used by genealogists and half of unnumbered lists (Samuel Fuller will be the eighth name), but merge the half columns vertically into full columns for the order used by the other half of unnumbered lists (John Turner will be the eighth name). ^ a b c Thomas Prince, A chronological history of New England in the form of annals (1736) Chronology 73, 84–86. Internet Archive. ^ Bradford listed 104 passengers, including: William Button, a servant of Samuel Fuller who died five days before landfall; Oceanus Hopkins, born at sea; Perigrine White, born two weeks after landfall; and seamen William Trevor and someone named Ely, both hired for one year. If the two seamen and Perigrine White are ignored (William Button's death is offset by Oceanus Hopkins' birth), one is left with the "101 who sail'd from Plimouth in England, and just as many arriv'd in Cape Cod Harbour" as listed by Prince. ^ Young, Alexander (1841). Chronicles of the Pilgrim Fathers of the Colony of Plymouth from 1602 to 1625. pp. 117–124. ^ Bradford, William (1898). "Book 2, Anno 1620". In Hildebrandt, Ted. Bradford's History "Of Plimoth Plantation" (PDF). Boston: Wright & Potter. Retrieved 2006-06-01. ^ Young 1841, p. 120. ^ a b c d George Ernest Bowman, The Mayflower Compact and its signers (Boston: Massachusetts Society of Mayflower Descendants, 1920). Photocopies of the 1622, 1646 and 1669 versions of the document. ^ a b Henry Martyn Dexter, [G. Mourt = George Morton], Mourt's Relation or Journal of the Plantation at Plymouth, 1865, pp.6–7, a reprint using original typeface, paragraphs, punctuation, spelling and embellishments, but not pagination. ^ Samuel Purchas, Hakluytus Posthumus or Purchas His Pilgrimes, Vol. XIX (Glasgow:James Maclehose, 1906) 313–314. Reprint of 1625 edition except that letters i, j, u, and v are used according to modern custom, contracted letters extended, printers' errors corrected, and repaginated from original four volumes to twenty volumes (I.xxvi). ^ a b William Bradford, Bradford's History "Of Plimoth Plantation" from the original manuscript (Boston: 1901) page 110 (photocopy of manuscript page follows). Passengers listed on pages 530–540. No annotations. Official printing by the Commonwealth of Massachusetts. This printing of the compact is identical to the 1856 version by the Massachusetts Historical Society. Spelling and contractions follow manuscript except for modern usage of u and v. Capitalization and punctuation differ from manuscript. A faithful transcription is at Mayflower Compact (1620) Archived 2009-03-03 at the Wayback Machine. ^ "Mayflower Compact : 1620. Agreement Between the Settlers at New Plymouth : 1620". Avalon Project, Yale Law School. Retrieved 18 February 2018. Source: The Federal and State Constitutions Colonial Charters, and Other Organic Laws of the States, Territories, and Colonies Now or Heretofore Forming the United States of America Compiled and Edited Under the Act of Congress of June 30, 1906 by Francis Newton Thorpe Washington, DC : Government Printing Office, 1909. ^ Samuel Eliot Morison, Of Plymouth Plantation 1620–1647 by William Bradford (New York: Alfed A. Knopf, 1966) 441–3. Wikimedia Commons has media related to Mayflower Compact.